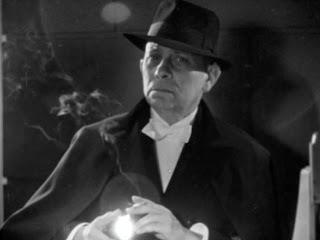 Synopsis: A successful stage magician named Diijon (Erich Von Stroheim) has retired his lucrative act in order to study the mysterious art of hypnotism. He feels he is on to something big, but his obsessive devotion to his studies is troubling to his wife Vicki and their friends. His lack of income is putting a strain on their marriage, but all attempts by Vicki's friends to help are rebuffed by the proud and arrogant Diijon. About this time, Tom Holliday arrives in town. He is an old flame of Vicki's and he too is concerned that she is being neglected. In an attempt to help her, he offers Diijon a gig at the club where he works as a bandleader. After much convincing, Diijon finally agrees; but because he is long out of practice he botches the act and is fired. Diijon is furious, and accuses Tom of trying to humiliate him in front of his wife. On his way home, Diijon stops at a diner for a cup of coffee. A shady character enters and tries to hold the place up – but Diijon manages to hypnotize the man, forcing him to give up his gun and return the money to the owner. Intrigued by his success, Diijon hypnotizes the man selling papers at a newsstand -- getting him to shout for all to hear that he is selling the evening edition, when he is in fact selling the morning edition. It becomes clear to him that he can hypnotize anyone, and his subjects will do whatever he orders them to do. But how far does his control go? As something of an experiment, he hypnotizes family friend Danton, forcing him to write a suicide note and then throw himself off a bridge. Now that he has established a means to kill through hypnotism, Diijon decides to take revenge on Tom and Vicki – by hypnotizing his now-estranged wife, and forcing her to kill Tom at the club, in front of hundreds of witnesses…. Comments: What a difference twelve hours makes. On the noon show we had to witness that Monogram train wreck Return of the Ape Man. Now, at midnight, we have another poverty-row production. But this PRC thriller is as lively and clever as Return of the Ape Man was witless and lazy. 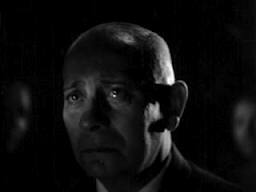 The Mask of Diijon has an intriguing premise and an extraordinary lead performance by Eric Von Stroheim. On the surface Diijon might seem to be a pretty straightforward role, but in fact it is quite difficult to pull off. Diijon is not a conventional antihero -- he is proud and haughty, often taciturn, but when he speaks his words drip with acid. Von Stroheim excels at this, providing a strong undercurrent of menace whenever he is onscreen. He never once raises his voice. Quite the opposite -- some of his most chilling lines are delivered in almost a murmur. 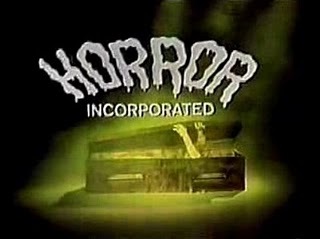 The reason this little thriller has been largely forgotten is probably due to its extremely contrived ending. The movie stands up very well until the last ten minutes or so; then the wheels simply come off. The ending doesn't match the quality of the rest of the screenplay, and I suspect it was written very quickly. But whether it was meant to replace a different ending that was deemed unacceptable, or if the screenwriters simply didn't know how to close it out, no one knows (well, okay - I don't know) . 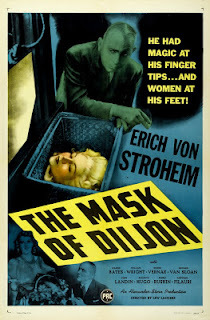 It's too bad -- The Mask of Diijon might have been regarded as a minor classic. But movies are a bit like marathons -- it doesn't matter how well you do along the course if you can't make it to the finish line. Synopsis: Hard-boiled criminal Slick Rawley (Ralph Bellamy) has been in some tough jams before, but he's really done it this time. During a botched bank job he killed a cop, and now every badge in America is looking for him. He leaves his girlfriend Peggy Russell (Isabel Jewell) in the care of his pal Gloves (Ward Bond) and runs for it. Hiding out in a lecture hall at a medical college, he hears Dr. Clifford Schuyler (Thurston Hall) expound on his theory of crime: career criminals, he says, are the victims of a medical defect -- namely, small tumors in a certain region of the brain. Remove the tumors, Schuyler says, and the criminal can be permanently cured. He has tested his theory on vicious dogs and apes, and in all cases the animals become gentle and docile after the brain surgery. But as much as Schuyler wishes to test this surgery on a human, the criminal justice system won't allow it. Rawley follows Schuyler home and offers himself as a test subject. He convinces Schuyler that this might be his only chance to verify his theory, and he asks for only one thing in return: plastic surgery so that he can forever evade detection. After the surgeries, Rawley (literally) looks like a new man, and he remembers nothing about his past. Dr. Schuyler tells him that his name is James Blake, that he lost his memory in a car accident, and that he has no living relatives. Blake proves to be an honest, caring and hard-working man -- the very opposite of Slick Rawley. Seeing that Blake is inquisitive and fascinated by medical books, Schuyler enrolls the young man in college, and then medical school. Soon Dr. James Blake is a renowned physician and philanthropist, a man of sterling character, dedicated to improving the lot of America's prison population. But when Peggy happens to meet Dr. Blake, she begins to suspect that he is her former boyfriend. A dogged police detective begins to think so too. But is Slick Rawley really dead? And if he is, how can Dr. Blake be held responsible for his crimes? Comments: Just the other day I read about a scientist who is zeroing in on the causes of violent behavior. Apparently the brains of psychopaths and murderers often have the same peculiarity: a region of the brain called the orbital cortex is much less active in these patients than in normal people. The orbital cortex serves as a kind of braking mechanism, governing the activities of the primitive amygdala, which houses fear and rage and aggression -- the whole Incredible Hulk portfolio. Without that brake in place, aggressive behavior spins out of control and mayhem ensues. That got me thinking about The Man Who Lived Twice. Even though that film was made some 75 years ago, its premise still holds up today: what if violent criminals were potentially decent people who just happened to have malfunctioning brains? And what if those brains could be repaired? And the movie as a whole still holds up well. 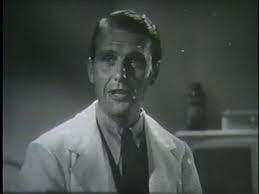 Ralph Bellamy really shines here, making weaselly, beady-eyed Slick Rawley seem a completely different character from the calm, good-natured Dr. Blake. 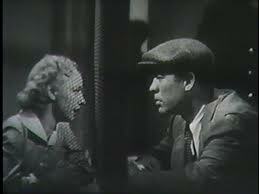 And the rest of the cast is just as strong, with Ward Bond turning in a very convincing performance as Gloves. The Man Who Lived Twice isn't particularly well-directed, which should surprise absolutely no one; it was the work of Harry Lachman, an old hand at low-budget programmers. His movies were always shot in the most straightforward way possible -- no frills and nothing fancy. The Man Who Lived Twice is probably Lachman's best film, with the possible exception of some of the Charlie Chan pictures he did for Fox during the Warner Oland era. 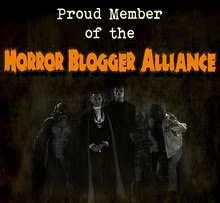 There is still a good deal of affection out there for those movies. And I'll admit they're a lot of fun. What I remembered most about THE MASK OF DIIJON was that it was Edward Van Sloan's final genre film, five more titles ahead of him, retiring by 1950. 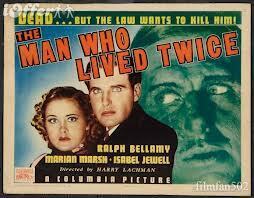 Ralph Bellamy's makeup was excellent, even my father didn't recognize him. Quite a contrast from his usual roles, or his latter day part in 1983's TRADING PLACES.